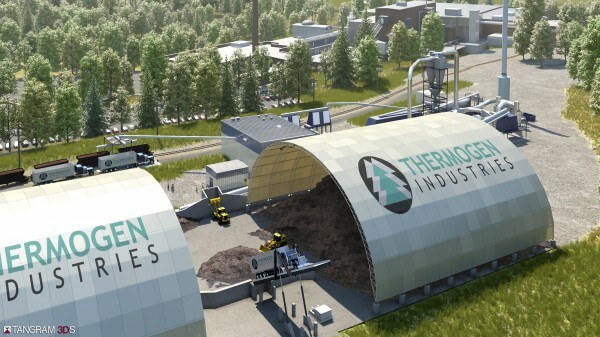 Thermogen Industries, a subsidiary of Cate Street Capital, supplied a rendering of its proposed torrefied wood facility at the Katahdin Avenue paper mill site in Millinocket to the Town Council on April 25, 2012. MILLINOCKET, Maine — Most of the old Great Northern Paper Co.’s buildings will be razed as the new GNP and its parent company prep the Katahdin Avenue mill site for an industrial park, a company spokesman said Saturday. Cate Street Capital executives are keeping busy with the razing of six buildings totaling about 127,760 square feet, continuing development of a torrefied wood factory on the site, plans to start a $120 million pellet mill in Eastport next year, and the continuing success of the East Millinocket paper mill, said spokesman Scott Tranchemontagne. Work on the Katahdin Avenue campus began last fall when contractors began developing a site for a $35 million torrefied wood mill that Cate Street subsidiary Thermogen Industries LLC hopes to begin building this this spring, when the ground thaws. Thermogen is also developing the Eastport project. Due to start in two weeks, the razing of the old buildings will clear space for an accompanying industrial park, Tranchemontagne said. The No. 11 paper machine owned by the new Great Northern Paper Co. LLC, another Cate Street subsidiary, and the machine’s accompanying support structures, will remain intact. So will the E&R building, nearby administrative offices, some garages and other, smaller buildings on the site, Tranchemontagne said. The demolition and salvage work will earn an undetermined amount of money for GNP that the company will put back into its operations, said Tranchemontagne, who had no information on Cate Street efforts to lure tenants to the site. The company also owns two paper machines in East Millinocket that employ about 257 people. One machine was booked through January and company officials have orders to constantly run one machine through this month and almost all of March, Tranchemontagne said. The second machine typically runs three times a week. Great Northern Paper Co. LLC is about two months away from finishing the conversion of the East Millinocket mill’s No. 2 heating oil burner to liquid natural gas for $1.5 million. Expense associated with creating steam, which is critical to papermaking, was among the reasons the second machine was shut down through some of the winter, Tranchemontagne said. Millinocket’s demolition work will be done by Testa Corp. of Lynnfield, Mass., Tranchmontagne said. Testa demolished the Boston Garden and Seabrook Nuclear Power Plant, did about 90 percent of the demolition for the Central Artery/Tunnel Project in Boston — better known as the Big Dig — and handled the parking expansion, roadway improvements and Terminal A demolition at Boston’s Logan International Airport, according to the company website, testacorp.com. A 31,000-square-foot warehouse, digesters and sulfite equipment within a 34,800-square-foot building, a 20,000-square-foot screening room, several storage tanks; a 15,000-square-foot training center, and two paper rooms each 13,480 square feet are among the buildings to be demolished, Tranchemontagne said. “Ultimately they will have a multi-tenant facility there,” Tranchemontagne said. The Thermogen machine will be located just east of the No. 11 paper machine and well west and north of the administration buildings, he said. The razing of the buildings will improve the campus and the effort to attract industrial-park tenants, Tranchemontagne said. The work will also create several more access points to the buildings that remain, he said. “It will allow us to make it [the campus] a very attractive place. Right now it is not as attractive as it could be,” Tranchemontagne said.